TYPES OF SOIL There are three major types of soil, namely; sandy soil, clay soil and loamy soil. SANDY SOIL. Any soil sample that contains sand particles. 1 TYPES OF SOIL There are three major types of soil, namely; sandy soil, clay soil and loamy soil. SANDY SOIL. Any soil sample that contains sand particles in higher proportion than other particles. Characteristics It is coarse and gritty to feel. It has large particle size with large pore spaces. It has low water holding capacity . It has high porosity i.e easily drained. It is well aerated . It is poor in nutrient . 3 1.Mention three types of soil. 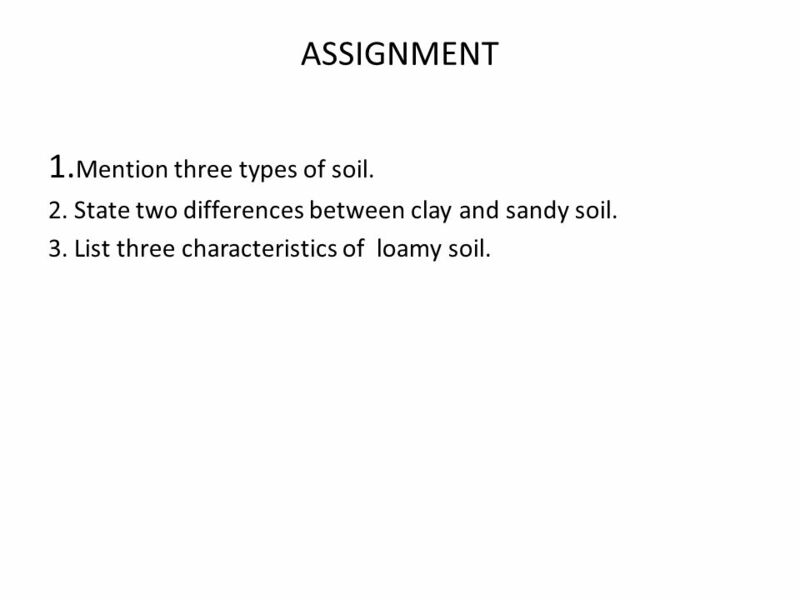 ASSIGNMENT 1.Mention three types of soil. 2. State two differences between clay and sandy soil. 3. 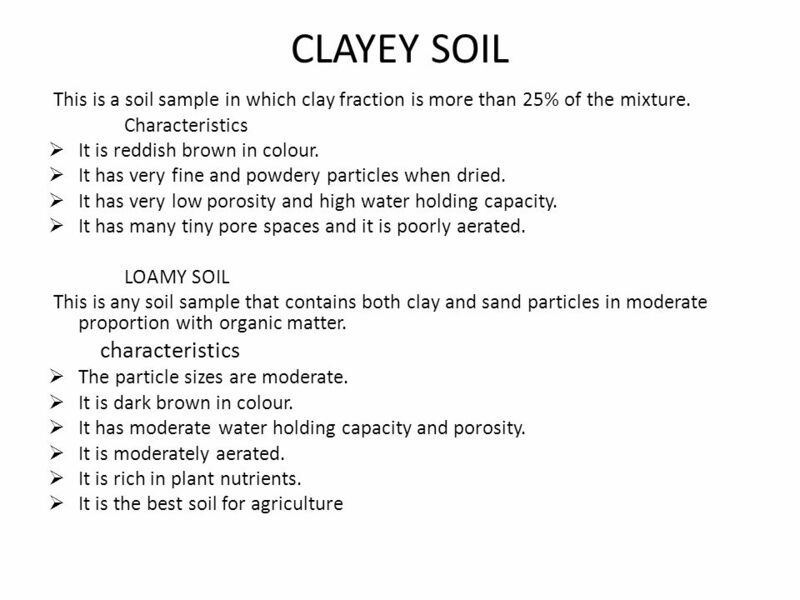 List three characteristics of loamy soil. 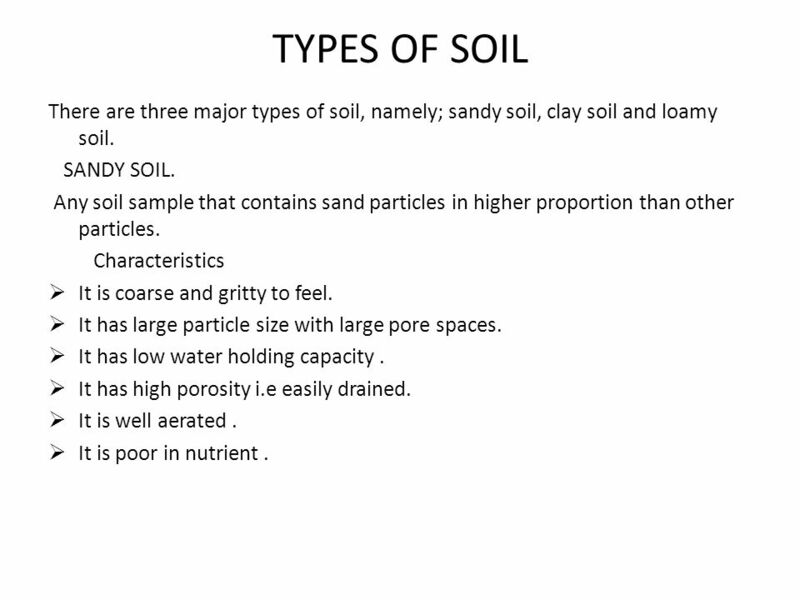 Download ppt "TYPES OF SOIL There are three major types of soil, namely; sandy soil, clay soil and loamy soil. SANDY SOIL. Any soil sample that contains sand particles." Soil Much more than "dirt". SOIL PARTICLES Soil provides support and nutrients for plant growth. Texture Soil texture is determined by the size of the weathered rock particles it contains Sand – 0.05 – 2 mm, feels gritty Does not hold water well. The Scoop on Dirt. Soil Soil is made up of weathered rock, including gravel, sand, and silt. Topsoil comes from subsoils and rocks beneath the surface.  Necessary materials: PowerPoint Guide Teacher Information! NC STATE UNIVERSITY DEPARTMENT of SOIL SCIENCE NC STATE UNIVERSITY DEPARTMENT of SOIL SCIENCE Relating Texture to Hydraulics. Soil 3 – Soil Composition. The ideal composition of soil, 25% Air, 25 % H 2 O, 45% Mineral Matter 5% Organic Matter. Texture. Particle Size Distribution (Texture) Important for determining suitability for various uses Considered a basic property because it doesn’t change. All About Soil All About Soil. Soil can basically be separated into 5 main parts: 1.Humus 2.Clay 3.Silt 4.Sand 5.Gravel. Properties of Soil. Where does soil come from and how does it form? Most soils were originally created through the breaking down (weathering) of the solid. Soil Texture Getting a feel for the soil!. Soil Texture Defined The relative proportions of the various size groups of individual soil grains (namely. Soil provides… nutrients for plant growth. Soil comes from: Rocks Minerals Decaying Organic Matter. What is the best soil for growing plants? Loam soil that is made of almost equal parts of clay, sand, and silt is the best. This texture is important so.